In this disturbing 5-part series for VICE Sports, directed by Adam Kurland & Matt Wyatt, former NFL players tell their stories of how prescription pain meds were abused and became part of the locker room culture much to the detriment of their long-term health. Produced by Frank Marshall & Julie Foudy, this short film tells the story of US Women's National Team member Christen Press and her journey through failed women's leagues led her to a spot on the national team. This is meant to be one episode in a 6 part series of the gender inequality women face in soccer globally. 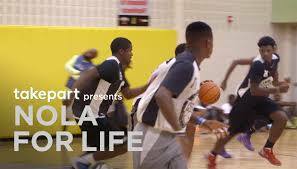 Directed and produced by Emmy nominated and award winning cinematographer, Cliff Charles (HBO & Spike Lee's "When the Levees Break" and "The Creek Don't Rise") the Midnight Basketball League was brought back to New Orleans by the Mayor's office as part of his NOLA for Life program to reduce crime and homicide.